It has been three days since my re-entry into the real world after spending 12 days in Panama. Three days since I was lazing around in a private villa (I’ll get to that later), and three days since I had nothing else to think about except what to have for lunch. Panama was NEVER on my bucket list. Aside from knowing of the Panama Canal, I didn’t give this Central American country a millisecond of thought. I definitely didn’t think of it as a must-see destination. My opinion has now shifted. I’m so fortunate that I was asked to consider leading a yoga retreat to Panama by The Travel Yogi, a company that pioneered the yoga and adventure industry. It would be my first retreat with The Travel Yogi, and I was thrilled to join forces. I was especially excited to relinquish the often burdensome work of planning a retreat. Fast-forward several months to GO time. I landed in Panama City on a humid Saturday afternoon and was met by Raúl, the driver of my airport transfer, who slowly spoke to me in Spanish and patiently listened as I tried to remember the conjugation of half a dozen verbs. Raúl dropped me off at the lovely Central Hotel, in the historic Old District known as Casco Viejo. 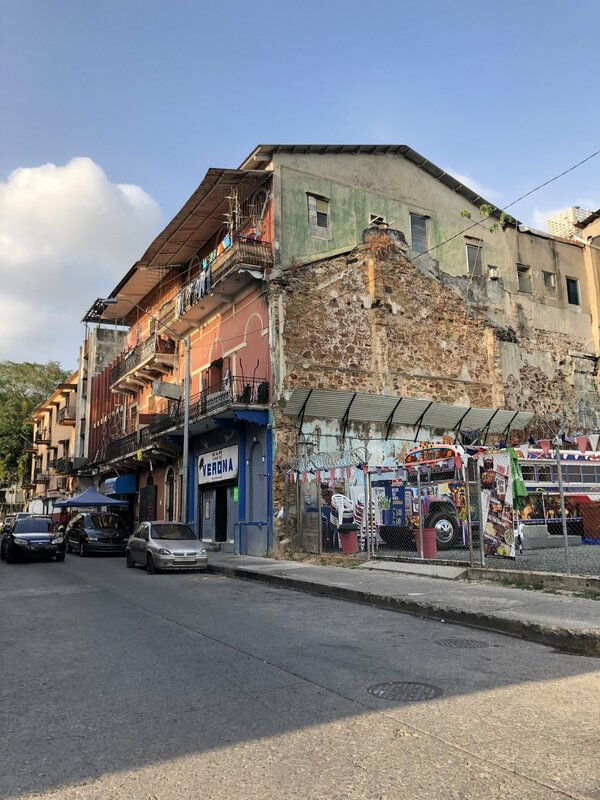 Our retreat group began our time together with a two-hour guided tour through Casco Viejo, during which we learned of the high-speed gentrification process underway. Only 20 years ago Casco Viejo was overrun with gangs. Today many gang members have chosen a new life outside of crime; some of them are now even working in the tourism industry - one of whom narrated part of our tour. Casco Viejo, or the Old District, in Panama City. The Old District is an incredibly charming area of Panama City, but its shininess is a stark contrast to the slums just a few blocks away. Imagine colorful Spanish and French colonial buildings with wispy, wrought-iron balconies adorned with flower baskets; the area teeming with tourists milling about in the safety of police-protected streets. Then imagine the same style of buildings, but with graffiti-laden crumbling walls and balconies used to hang laundry; these neighborhoods are still home to many locals. It felt like a real-life version of the Prince and the Pauper. A neighborhood just blocks away from Casco Viejo. Some visitors may be put off by seeing this reality. I was fascinated by the dichotomy of poverty in third-world Panama alongside its partial glitzy revitalization. After a good sleep, we headed to a regional airport for a hopper flight to Bocas del Toro, an island location along the Caribbean Sea. A bumpy van ride brought us to the Island Plantation Resort, a Balinese-inspired hotel nestled into the vegetation near the pristine beach of Playa Bluff. Here we were able to put our feet up and drop into a much needed state of relaxation. The sea waves, which crashed onto the beach near the hotel, were both a welcome sound and a beautiful sight. But for yours truly, these waves were only for wading and not swimming, simply due to my fear of the riptides. A couple of my retreat participants, whom I’d classify as true water babes, were more than happy to dive into the waves and play. Watching them frolic with Mother Nature’s most powerful force was a thing of beauty. I led two yoga classes daily, most of which were held high up in an open-air shala hidden in the jungle canopy. The trek to the shala was almost 200 steps straight up, so we joked it was our “warm-up” before our practices. Two of the evenings, we found quiet places on the beach to sit and be introspective, to fall deeply into meditation, or to simply watch the waves and think of nothing else but the present moment. Isla Zapatillas, a protected, uninhabited island in the province of Bocas del Toro. Speaking of those incredibly slow-moving creatures, I spotted one more as we headed back to the airport on our final day in Bocas del Toro. He was getting a little snack of leaves, and seemed unfazed with us yogis as we made him Instagram-famous. It was the perfect way to say good-bye to an island that boasted so much beauty, and provided a healthy balance of adventure and self-care. Back in Panama City, it was time to wrap up our time together with a final dinner and big hugs. It’s amazing how a group of people who are strangers beforehand can come together to not only find common ground, but also to establish mutual respect and admiration for one another. This is the magic of a yoga retreat. I planned to stay a few extra days in Panama with one of my friends, who had also participated in the retreat. After a lot of changes to our post-retreat accommodations, we finally settled on a couple extra nights in Casco Viejo. We stayed at the The American Trade Hotel, a picturesque place with a colorful history that includes once being home to gang warfare. It was only recently renovated about a decade ago in order to be reopened as a high-end hotel. You can’t make this stuff up. The private pool suite in Villa Caprichochosa on Taboga Island. The cherry on my already wonderful Panamanian cake was our stay at Villa Caprichosa, an Italian-inspired boutique hotel on Taboga Island. We had booked a lovely little room, but then caught a glimpse of the “Pool Suite,” a private villa with its own pool. We instantly made the decision to upgrade. As we were the only guests in the hotel for our two-night stay, we also were lucky enough to have a private chef…seriously, had we magically become celebrities? We kept pinching ourselves. Our villa was straight out of 18th-century Europe, with high-glass windows, beautifully-designed furniture, flowing curtains and romantic flourishes of art throughout. The owner of the property, Diane Hurd, is an internationally-recognized designer, whose own elegance and charm rival her exquisite taste. Having reflected on my time in Panama, I realize it was such a gift. Just like the facets of a diamond, Panama’s many different sides come together in sheer brilliance. Everything from gentrified, polished buildings, to poverty-stricken slums; from tropical islands of adventures, wildlife and the occasional torrential downpour, to serene moments of a classy, private villa. It is all authentic. It is all beautiful. I’m aware of my privileged position in life to be able to experience a country as colorful as Panama, and I don’t ever take it for granted. All I can offer in return is my gratitude, and the sincere hope to one day visit again. What does the word “mindfulness” mean to you? If I’m being honest, it falls into the same category as “self-care” and I’m tiring of that term. For me, I used to only equate mindfulness with meditation. But I’ve begun to realize it can be in the smallest moments: like washing the dishes, or taking a few deep breaths at the stoplight. I now do what works for me when it comes to meditation. So what if I don’t wake up before the rest of the family and meditate in lotus position (ahem, like the photo here)? So what if I have to scratch my nose midway through? Instead of trying to meditate in the way I thought a good yogi does, I have instead found a practice that works for me and to which I look forward. Here’s how it unfolds: on weekday mornings, I wake up and get the kids up; then breakfast is prepared and eaten; lunches are prepared and boxed; conversations are enjoyed; and finally hugs and kisses are doled out before everyone dashes off to their respective places. I relish the morning chaos, and immediately after, I cherish the stillness. It’s in this moment of stillness where I plop down on the couch for 15 minutes, with eyes closed and just focus on my breath. I may count each breath cycle or attach a simple mantra to it to stay present. Since thoughts cannot be controlled, I watch them come and go, as well as any resulting feelings that arise. If I miss my morning meditation, I make a point of doing it later in the day. In my opinion, any time is a good time to turn inward. Once my meditation is complete, I jot a few thoughts down in my journal. Nothing earth-shattering, but it helps me to notice the patterns that emerge from my constant self-chatter. Also, by writing down my goals (even my to-do lists) it keeps me accountable. Then I set my mind on my next task and go do it (similar to setting one’s drishti - eyes focused on one point). I have found that this practice keeps me on task throughout the day. I am even less interested in the external distractions (especially social media, which is a huge win). I know this practice is challenging…it has taken me years to find it somewhat comfortable. So, if you’re starting out, I encourage you to just focus on a few small, quiet moments without distractions. No need to overcomplicate being mindful. Just take time to appreciate what is truest to you: your breath and your heartbeat. Today my youngest son’s school begins a “Kindness Challenge.” It’s a week-long effort to promote kindness toward one another. The school sent the kids home with a list of kind acts - things as simple as smile at 25 people or bring a nice note for your teacher. It’s a wonderful way for kids to realize that the smallest actions can have a great impact. I recognize that there are children (and adults for that matter) who need a kindness reminder. They need “the list” to rustle up deeply-hidden feelings of compassion and kindness. So a “Kindness Challenge” is essential for this specific group as it may be the push necessary to help them flex their thoughtfulness muscles. What I am hopeful for, though, is that a week focused on kindness is simply supplementary to the daily actions of the majority of people. In our home, we speak a lot about being kind to one another. It sounds a bit hippie dippy, but I think this is why my boys are so thoughtful. It’s my firm belief that we must not only teach and encourage our children to be kind, but SHOW them in our ways of being. How parents interact, including the tone and words used in conversation, instill a positive or negative feeling in children. They know when you’re in love because they see the hugs, but they also know when you’re giving Daddy the silent treatment. Catching ourselves in the moment when we’re about to go to the Dark Side is especially crucial when children are watching. The lessons of kindness also extend outside the home. When my boys were very young and we would see a child yelling at his mother, or another child being nasty to her sister, I’d come down to their level and ask what they thought of the situation. I’d ask how they thought the mother or sibling felt, and what they thought the upset child was feeling. I asked them if there may have been a kinder way to express those feelings. This had two positive outcomes: my boys never wanted to be the kid freaking out at the store because they now realized how it looked from the outside, and they became more aware of how to express their feelings without disparaging or neglecting those of others. We would also speak about how some children have behavioral or developmental issues that prevent them from assessing their situations thoughtfully and acting in a productive way. I wanted my boys to understand and sympathize with these children who might not have the same self-restraint they do. This resulted in them realizing that we must appreciate our differences, and to always send positive vibes to others because you don’t know what their story is. Now that my children are a little older (9 and 12), we don’t need to remind them to be kind. They are generally very empathetic. What we are doing now is reinforcing more compassionate ways by seeking out volunteer opportunities in which to engage as a family. How can we bring joy to others? What can we do to effect positive change?